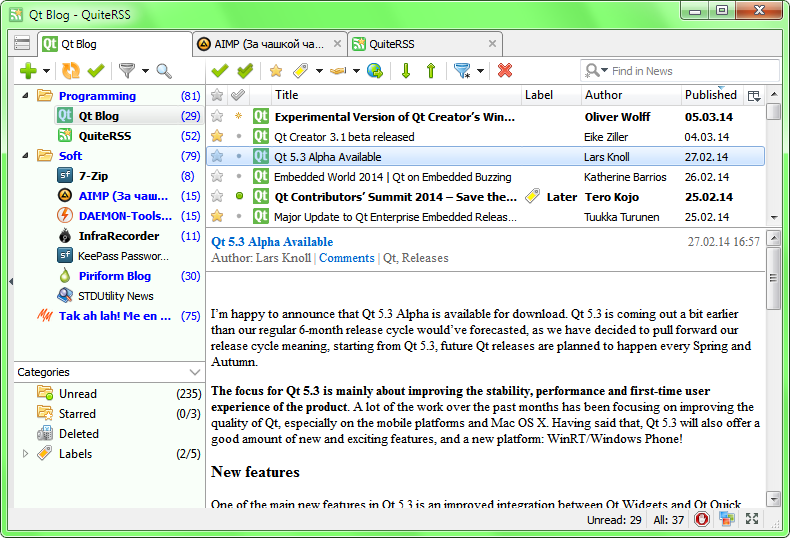 QuiteRSS is an RSS/Atom news feeds reader with an easy-to-use, multi-tabbed layout and embedded browser. The program includes the ability to tag feeds with different labels, share via social networks, perform search operations, delete the selected news, as well as import/export feeds (OPML-files). Views are filtered by date, unread, read, or starred items. The program has a Webkit core that includes Adblock and ClickToFlash (manual Flash controls). Cross-platform with clients available for Mac, Linux and BSD. Alternatively, QuiteRSS Portable is also available. How to extract: Download the "Portable" ZIP package and extract to a folder of your choice. Launch QuiteRSS.exe. Support for Qt 5.11 (Linux). Downloading feeds' icons for some feeds. Is it possible to increase the font size? It's too small. Excellent app, very easy to set up. I use it instead of feedly now.